One of our most popular sizes, 100g Gold Bars are a great choice for both entry level and established investors. People are increasingly drawn to gold as a reliable haven for capital; it is proven to perform well in times of economic unease and your investment is less prone to the effects of inflation and currency fluctuation. 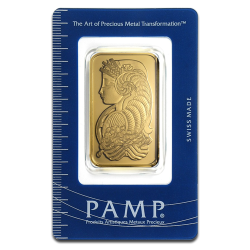 Choose from either cast or minted 100g gold bars, depending on your preference. Each has its own distinct character; cast bars are the classic ingot while minted bars have a contemporary finish. However, they all contain exactly one hundred grams of pure 24 carat gold. We only stock LBMA approved products and all our gold 100g bars are VAT Free to buyers within the EU.